This is such an important question we`re all trying to answer today: „how to build a better world?“. It`s hard to find an answer, but I know this much: In order to build things, you need the right tools. So today I`d like to talk with you about the most creative and powerful tool of the 21st century – the computer. But first let me get something off my chest: I work as a teacher and my subjects are German and catholic religion. So you may think I`m one of the least qualified persons in the world to talk about computers, and you`re probably right. But I`m not really here to tell you how artificial intelligence or the internet work, I want to share with you three things I learned about computers. 4 years ago I started a computer club in my school. The same year a little computer called Raspberry Pi was released by some very passionate people in the UK. It was made especially for schools so I bought one and… I hated it, because it`s quite the opposite of any other computer you can buy: nothing works „out of the box“ – there was no operating system, so my screen was black, when I first turned it on. There wasn`t even a manual. But I saw on the internet that you can build cool stuff with it. So I bought ten of these computers and thought „let`s give it a try“ and this was the beginning of a very interesting journey. From there on I had one question in mind: What is it, that everybody in our modern society – especially pupils and teachers – should know about computers? Because this is the main question right now in our german education policy. Should every kid have a tablet in school? Should they learn how to code? Should there be a new subject like „computer science“? While I was thinking about that question, I found a mechanical calculator in my parents attic. I brought it with me. It`s quite easy to understand how it works and it was a very common piece of technology in offices around the world until the 70s. Let me show it to you: You can add numbers by pressing buttons in the same row and then the result is displayed down here. The reason why there are no gears or other moving parts in a modern computer, is the transistor. It works as an incredibly fast electronic switch. When you use binary code and connect two transistors to a logic gate, you can calculate, just like with a comptometer. The transistor is probably the most important invention of the past 100 years. And this is the first thing I think everybody should know: a modern smartphone or tablet consists of several billion transistors which can turn on and off. But what can you do with these switches? This is where the Raspberry Pi comes into play. This is what it looks like and this is basically what lies beneath the screen of your smartphone or tablet. 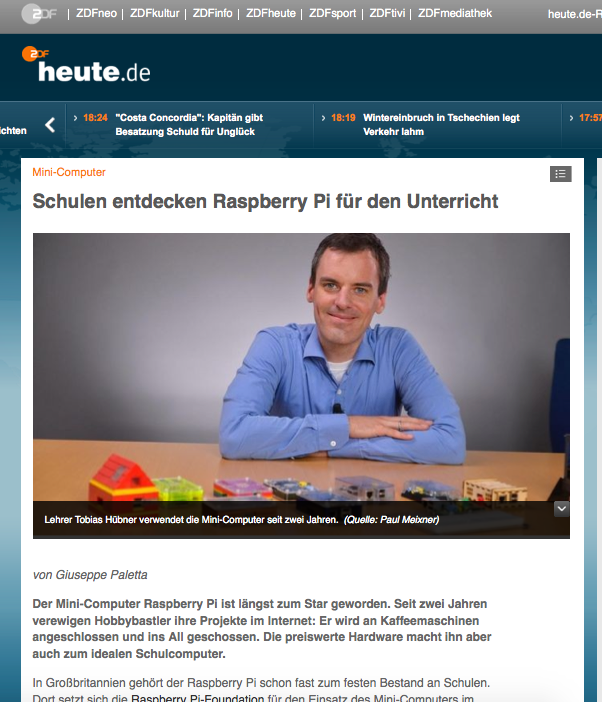 The cheapest version of the Pi costs just 5,- Euro, the reason why it`s so cheap is because it`s developed by a charity that wants to promote basic computer science in schools all over the world. Still it`s a fully functional computer with USB, HDMI anda Micro-SD-Card, that serves as a hard disk. As you can see – the Pi has a graphical desktop much like any other PC. You can run Office Software, image editors like GIMP, Mind Map Software and of course there is a browser, an email-application and so on. But the fun stuff is that the Pi makes it very easy to learn programming and this is the next thing, everybody should know about computers: learn how to write simple code. And now I can put blocks in the world by typing mc.setBlock(x,y,z,1), I can put blocks in the world. The last number is the block type. So I can change this number and then the block changes to stone, water or lava. Now I can also put in several blocks at once by typing: mc.setBlocks(x1,y1,z1, x2,y2,z2,1). And this is all you need to write your own program which builds – for example – a house. Or like in this case: a diving platform. This makes it possible to build all kind of fun stuff. For example when I want to show kids how the GPIO-port works, I let them build their own game-controller. It`s made from the package of a surprise egg and some very inexpensive parts: a button, an LED, a resistor and a few cables.Or this one, with a real joystick & buttons and a bluetooth controller, so you can connect it to your PC or playstation.You can also build a moving LEGO-robot, like here this PI-powered LEGO robot which you can control with a Nintendo Wii-Mote. Or you can take an old game boy and bring it back to live with a Pi inside. And this leads us to the third thing, everybody should know about computers: How can I use it tobuild things? Now we just tinkered around with the Pi, but let me tell you what smart people do with it. This is the smartest person I found. Myrijam Stoetzer is just 16 years old, but she used the Raspberry Pi to build a wheel chair with eye detection, and right now she`s using it to detect vains in the body. And although Myrijam is probably smarter than the average, everybody can use the Pi to solve real lifeproblems.Steve Jobs once said: „What a computer is to me is it’s the most remarkable tool that we’ve ever come up with, and it’s the equivalent of a bicycle for our minds.”Well, I really do believe that`s true and you should really try it yourself. Don`t adapt to the digital world, learn how to use it for the things you want. So let`s get back to the central question: What is it, everybody should learn about computers? Three things: How does the hardware work? How can I control it? What can I do with it? To learn all this, you have to connect with other people. Somebody once said: The Raspberry Pi is not a computer, it`s a community. So what we need are places in our cities, where people can connect and learn. This is what we`re trying to do right now by building a coding school for kids, teachers and parents in Düssseldorf. And I really want to encourage you to do the same thing. Either join an existing club in your city or do it like I did and try it for yourself. This helps us becoming producers instead of consumers. And maybe this helps building a better world – thank you!